5. Department of Gastrointestinal Surgery, the Affiliated Hospital of Xuzhou Medical University, Xuzhou 221002, Jiangsu Province, China. Long noncoding RNAs (lncRNAs), with length of more than 200 nucleotides, are not translated into proteins but involved in multiple diverse diseases, especially tumorigenesis. The dysregulation of lncRNAs greatly contributes to the progression of various tumors through specific signaling pathways, including Wnt/β-catenin signaling pathway, which is associated with malignant features of tumors. The interactions between lncRNAs, which have specific expression characteristics in diverse cancer tissues, and Wnt/β-catenin signaling pathway, exhibit potential as novel biomarkers and therapeutic targets. In this review, we aim to present research findings on the roles of Wnt pathway-related lncRNAs and their effects on Wnt/β-catenin signaling to regulate tumorigenesis in different cancer types. Results may be used as basis to develop or improve strategies for treatment of different carcinomas. Long noncoding RNAs (lncRNAs), a class of nonprotein coding transcripts, have a length of more than 200 nucleotides and participate in chromatin remodeling, transcriptional control, posttranscriptional processing, and protein metabolism[2-4]. Scholars have focused on lncRNAs since lncRNA H19 was reported in 1990. Many lncRNAs participate in the pathogenesis of different diseases; such lncRNAs include H19 in abdominal aortic aneurysm (AAA), ROR in myocardial I/R injury, and DANCR in osteoarthritis. With the development of bioinformatics and functional genomics, studies have found that lncRNAs exhibit significant functions in tumorigenic processes, such as cell proliferation, apoptosis, differentiation, and invasion. Once considered as a crucial component of tumorigenesis, lncRNAs have been discovered to be associated with different cancers. For instance, MALAT-1 promotes the migration, invasion, and epithelial-mesenchymal transition (EMT) of gastric cancer (GC) cells. High expression levels of HOTAIR and CCAL are correlated with poor prognosis in patients with CRC. Overexpression of HOTAIR is highly linked with the progression and metastasis of early-stage, surgically resected breast cancer. The dysregulation of lncRNAs is associated with tumorigenesis, and their aberrant expression has important pathogenic consequences through different mechanisms. Guide lncRNAs bind to the regulatory or enzymatically active protein complexes and guide them to specific target gene promoters or genomic loci. Scaffold lncRNAs provide central platforms for various protein complexes to tether to so they can be guided to specific location. Decoy lncRNAs activate or silence genes by interacting with transcription factors or repressors to bind to the target gene promoters. Moreover, lncRNAs considerably affect specific signaling pathways because they regulate cancer cell survival and death; the expression of lncRNAs indicates an active signaling event regardless of their roles in the signaling process. For example, Sun et al. found that the downregulation of lncRNA RP11-708H21.4 promoted colorectal cancer (CRC) tumorigenesis through the AKT/mTOR pathway. Meanwhile, metaLnc9 could activate the AKT/mTOR pathway to facilitate the metastasis of nonsmall cell lung cancer (NSCLC). Increasing lines of evidence have confirmed that lncRNAs are involved in various cellular processes and appear to be tissue-specific drivers of cancer phenotypes. Hence, lncRNAs could be used as predictors of patient prognosis and as treatment targets. The Wnt signaling pathway is an important extracellular pathway that was discovered in 1982 along with proto-oncogene Int1 (also known as Wnt1). This complex and ancient pathway is involved in a multitude of developmental processes, such as cell growth, differentiation, individual development, migration, genetic stability, apoptosis, self-renewal of stem cells, and maintenance of adult tissue homeostasis[20, 21]. The Wnt signaling pathway comprises two different intracellular signaling pathways: the β-catenin-dependent pathway (known as the canonical Wnt pathway) and the β-catenin-independent pathway (known as the noncanonical Wnt pathway). Compared with other signaling pathways, the canonical Wnt/β-catenin pathway is highly evolutionary conserved and mainly involves β-catenin. In the absence of Wnt ligands, cytoplasmic β-catenin is recruited into a destruction complex containing glycogen synthase kinase 3β, adenomatous polyposis coli (APC), casein kinase (CK) 1α, and axin and is then phosphorylated by CK1α and GSK3β. The phosphorylated β-catenin is directly ubiquitinated by β-transducin repeat-containing protein E3 ligase and degraded by the 26S proteasome pathway to maintain a low level of β-catenin. When the Wnt ligand binds to the frizzled receptors and coreceptor lipoprotein-related protein (LRP), the former activates dishevelled proteins to phosphorylate low-density lipoprotein receptor-related proteins 5/6 (LRP5/6), which in turn disassembles the destruction complex so the phosphorylated LRP5/6 provides a binding site for GSK3β and axin. The stabilized β-catenin accumulates in the cytoplasm and translocates to the nucleus, where it binds to the T-cell factor/lymphocyte enhancer factor (TCF/LEF) of the transcriptional complex to activate the transcription of downstream genes, such as c-Myc, cyclin D1, matrix metalloproteinase 1 (MMP-1), and MMP-7. The noncanonical Wnt pathway is further divided into the Wnt/Ca2+ pathway and the Wnt/planar cell polarity (PCP) pathway. As a core mediator, the Wnt ligand is needed in both pathways to bind to frizzled receptors and LRP and subsequently activate the DSH protein. Hence, Wnt proteins depend on a particular combination of Wnt receptors and coreceptors. The interaction of different Wnt ligands, which are all Cys-rich encoded by 19 Wnt genes, with different Fzd receptors would decide the downstream signaling pathway. WNT signaling can promote or inhibit tumor initiation, growth, and metastasis and drug resistance in a cancer stage-specific or a cancer type-specific manner by regulating the expression of specific target genes, such as c-myc, E-cadherin, and cyclin D1. The high expression of constitutively active β-catenin promotes the growth of myeloma cells in vitro. A previous work reported a high level of nuclear β-catenin in subpopulations of leukemia stem cells that can form tumors with short latency in mice. Moreover, overexpressing WNT1 induces the invasiveness of MCF7 breast cancer cells, and this effect can be attenuated by blocking β-catenin-dependent transcription. Hence, identifying genetic factors and biomarkers is important for predicting responses to treatment with WNT pathway modulators, for diagnosis and determining the prognosis of the cancer, and for developing novel therapeutics. LncRNAs with differential expression profiles in clinical CRC tissues have been suggested to contribute to the activation or inactivation of the Wnt pathway to regulate tumorigenesis. To explore the different roles of lncRNAs in the progression of CRC via the Wnt pathway, we enumerate all of the reported Wnt pathway-related lncRNAs (Table 1). With the development of scientific technology, increasing lines of evidence show that lncRNA-miRNA interactions mediate the functions of lncRNAs in CRC. Many CRC-related lncRNAs bind to miRNAs instead of the target mRNAs to regulate the expression of target genes; some of which activate the Wnt signaling pathway and promote tumorigenesis. For example, Zhigang Xiao et al. reported that lncRNA HOTAIR enhances drug resistance and promotes the proliferation of CRC cells through the miR-203a-3p-mediated Wnt/β-catenin signaling pathway. LncRNA MIR100HG confers cetuximab resistance in CRC because its two embedded miRNAs (miR-100 and miR-125b) downregulate the five negative regulators (DKK1, DKK, ZNRF3, RNF43, and APC2) of canonical Wnt/β-catenin signaling[36, 37]. Furthermore, XIST is highly conserved to bind to miR-34a. Given that miR-34a is closely linked with the 3′-UTR of WNT1, the production of WNT1 mRNA and its corresponding protein cannot be decreased in CRC due to the strong binding between XIST and miR-34a. In the presence of the WNT1 ligand, β-catenin can translocate to the nucleus to express growth- and invasion-associated genes. Several lncRNAs, such as CASC11, CCAL, and TCF7, could be involved in promoting the proliferation and invasion of CRC through diverse mechanisms via the Wnt/β-catenin pathway. CASC11 enhances the stability of hnRNP-K to increase its expression levels as a cytoplasmic lncRNA. By interacting with AXIN and GSK3 and forming a complex with β-catenin, hnRNP-K protects β-catenin from degradation and promotes its nuclear accumulation to activate the downstream of Wnt signaling. The ability of CCAL to enhance proliferation, cell cycle progression, invasion, and migration could be partly attributed to the fact that it inhibits AP-2α and subsequently activates the Wnt/β-catenin signaling pathway. In addition, TCF7 expression is regulated by lncTCF7 to activate WNT signaling and thus promote tumor metastasis and invasion in CRC. In contrast to many oncogenic lncRNAs, lncRNAs can alter the expression and activity of essential Wnt/β-catenin modulators to deregulate Wnt/β-catenin signaling in CRC. For example, lncRNA BC032913 upregulates the expression of TIMP3 and inhibits the nuclear translocation of β-catenin, thereby inactivating the Wnt/β-catenin pathway to suppress CRC metastasis. LincRNA-p21 can directly deregulate β-catenin at the posttranscriptional level to suppress the Wnt/β-catenin signaling pathway and enhance the radiosensitivity of CRC radiotherapy. Although the oncogenic interactions between lncRNAs and miRNAs have been extensively studied, some lncRNA-miRNA interactions remain unclear. The subsequent regulation of cellular signaling pathways in CRC can be treated as potential target to suppress tumor. The negative regulatory function of miR-942 by linc00675 contributes to the inhibition of Wnt/β-catenin signaling and the suppression of the development and progression of CRC . Wnt/β-catenin signaling, which is the key regulator for the progression of liver tumors, plays a critical role in the development and stemness of cancer cells[50-53]. Diverse oncogenic lncRNAs play important roles in regulating β-catenin by several mechanisms for the core component of the Wnt/β-catenin signaling pathway (Figure 1). The APC degradation complex and the β-catenin-TCF activating complex are the main targets to regulate β-catenin stability and activation by lncRNAs. For example, lncAPC recruits EZH2 to the APC promoter and inhibits APC transcription, thereby promoting the activation of the Wnt/β-catenin pathway and the self-renewal process of liver tumor initiating cells. LncLALA1 inhibits the formation of APC degradation complex because it recruits CTCF to the axin1 promoter to block Axin1 transcription and activate Wnt/β-catenin signaling pathway. Recent research reported that lncTCF7 can activate TCF7 expression in cis by recruiting the SWI/SNF complex. This evolutionally conserved multi-subunit complex consists of 12-15 subunits with several core components, such as SMARCB1/SNF5, BAF170, and BAF155[57, 58]. After the activation by the SWI/SNF complex, the overexpression of TCF7 combines with the lymphocyte enhancer factor of the transcriptional complex to activate the transcription of downstream genes in Wnt signaling, resulting in the self-renewal of liver cancer stem cells. 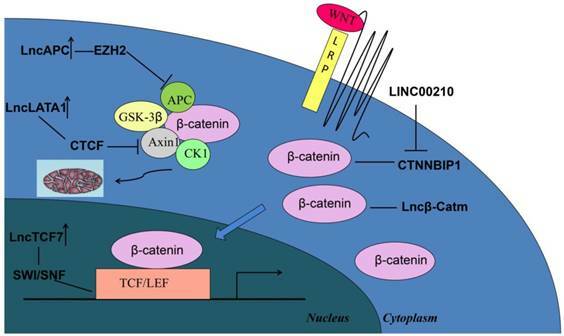 Moreover, overexpressed linc00210 in liver cancer tissues can bind to CTNNBIP1, thereby impairing CTNNBIP1-β-catenin interaction to promote β-catenin-TCF/LEF interaction and activate Wnt/β-catenin signaling and liver tumor initiating cell self-renewal. Alterations in β-catenin activity directly influence the development of liver tumorigenesis. LncRNA β-Catm, which is associated with β-catenin, enhances the expression of zeste homolog 2 (EZH2) to promote the methylation of β-catenin and inhibit β-catenin ubiquitination. The accumulation of methylated β-catenin allows the activation of Wnt-β-catenin signaling and maintaining the stemness of liver CSCs. Schematic of the activation of Wnt/β-catenin signaling by different oncogenic lncRNAs in liver cancer. Degradation and activating complexes are the two main targets for regulating β-catenin, whereas some lncRNAs may directly regulate β-catenin to influence tumorigenesis. Gliomas are the most common and aggressive primary brain tumors and account for approximately 80% of all cases of malignant brain tumors[61, 62]. In the past few years, the interactions of lncRNA and Wnt/β-catenin signaling in glioma have gained increasing research attention. Several lncRNAs, such as AB073614, CCAT2, CCND2-AS2, and DANCER, have been identified to be involved in promoting tumor proliferation, migration, and invasion in glioma via the Wnt/β-catenin signal pathway. The AB073614 expression increases in glioma and indicates poor prognosis; scholars have reported that the proliferation and migration of glioma cells can be increased by targeting SOX7 to activate the Wnt/β-catenin signaling pathway. LncRNA CCAT2 is upregulated in glioma tissues, and CCAT2 knockdown inhibits cell proliferation and tumorigenesis potential by suppressing the expression of the downstream genes of the Wnt/β-catenin signaling pathway. LncRNAs, such as CCND2-AS1 and DANCR, are correlated with poor prognosis in patients with glioma; after Wnt/β-catenin signals are activated, tumor proliferation and invasion are promoted. These finding indicate the involvement of lncRNAs and Wnt/β-catenin signaling pathway in glioma. However, the mechanisms on how lncRNAs activate Wnt/β-catenin signals to promote glioma must be further explored. Altering the expression and activity of core Wnt/β-catenin modulators has been proven as an essential method for lncRNAs in modulating Wnt/β-catenin signaling. LncNEAT1As, an essential architectural component of paraspeckle nuclear bodies, alters the epigenetic landscape of target gene promoters to promote transcription; as such, LncNEAT1As possesses oncogene characteristics in various cancers, such as breast cancer, CRC, and prostate cancer. Studies have demonstrated that NEAT1 functions as an oncogene in glioblastoma, and the WNT/β-Catenin pathway involves lncNEAT1 to promote the malignant progression of glioblastoma. Furthermore, knockdown of NEAT1 reduces the trimethylation modification of H3K27 in the Axin2, ICAT, and GSK3B promoter region via EZH2. Given that Axin2, ICAT, and GS3KB are WNT-negative signaling regulatory factors[72-74], lncNEAT1 decreases the expression of the axin2/ICAT/GS3KB complex to activate Wnt/β-catenin signaling. In conclusion, as a scaffold, lncRNA NEAT1 could bind to EZH2 and mediate the trimethylation of H3K27 in the presence of the promoters of target-specific genes (Axin2, ICAT, and GSK3B) to promote β-catenin nuclear transport, which might be a novel therapeutic target in glioblastoma. GC is the fourth most frequently diagnosed cancer and the second leading cause of cancer-related mortality worldwide. Although lncRNAs play an active role in cancer, their interactions with the WNT/β-catenin pathway are an emerging research field in GC. LncRNA HOTAIR is negatively correlated with miR-34a level; that is, overexpression of HOTAIR decreases the miR-34a level and leads to the activation of the WNT/β-catenin pathway; this phenomenon coincides with increased cellular proliferation. Similarly, lncRNA FEZF1-AS1 and lncRNA LINC01606, whose expression levels are upregulated in GC cells, activate Wnt/β-catenin signaling to promote tumor cell migration and invasion[78, 79]. LncRNA LINC01133 and ENST00000434223 are downregulated in GC tissues and cell lines, and its low expression is positively correlated with EMT and metastasis by inactivating the Wnt/β-catenin pathway[80, 81]. Moreover, lncRNA zinc finger antisense 1 (ZFAS1) has different expression levels in various cancers and exerts anti-tumor or pro-tumor effects on different cancers[82-84] since it was identified in 2011. GC tissue and cell lines highly express ZFAS1, which plays a cancer-promoting role in GC[85, 86]. The underlying mechanism of ZFAS1 in promoting GC may be associated with the Wnt signaling pathway. ZFAS1 recruits numerous transcriptional factors to execute its intracellular biological functions. Enhancer of zeste homolog 2 (EZH2) and LSD1 are two crucial substances that can bind to Kruppel-like factor 2 (KLF2) and NKD2 promoter regions to inhibit their transcription. As a mammalian ortholog of Drosophila naked cuticle, NKD2 has frequent loss of heterozygosity in CRC and GC[88, 89] and negatively regulates canonical Wnt signaling activity by inhibiting dishevelled proteins. Dishevelled proteins disassemble the complex that can destruct β-catenin by phosphorylating LRP5/6; as such, NKD2 can decrease the level of β-catenin in the cytoplasm to inhibit the Wnt signaling pathway. Hence, canonical Wnt signaling is highly activated to promote the malignancies of cancer cells by inhibiting NKD2 through overexpression of ZFAS1 in GC. Furthermore, silencing of ZFAS1 induces the inhibition of cell growth, proliferation, cell cycle, progression, migration, invasion, and EMT and enhances the sensitivity to cis-platinum or paclitaxel by suppressing canonical Wnt signaling. Lung cancer is one of the most common causes of cancer-associated mortality worldwide. NSCLC accounts for 80%-85% of all cases of lung cancers, leading to big economic losses; the current 5-year survival rate of patients with NSCLC is <15 %. Therefore, clinically useful biomarkers and therapeutic targets should be identified for diagnosis or treatment of NSCLC at an early stage. The upregulation of LINC00968 can promote the growth, migration, and invasion of NSCLC cells upon the activation of the Wnt/β-catenin signaling pathway. Multiple lncRNAs have been identified to contribute to the development and progression of NSCLC via the Wnt/β-catenin signaling pathway. Some examples of lncRNAs are NEAT1 and FOXD2-AS1, which are also related to Wnt/β-catenin signaling in NSCLC and have been proven as promising tumor gene therapeutic targets because of their abilities to promote the proliferation of NSCLC cells. Increasing the lncRNA SNHG1 expression could also enhance cell proliferation. The expression of SNHG1 has a negative correlation with miR-101-3p, and SOX9 could act as the target of miR-101-3p. Given that SOX9 has a great tendency to control oncogenic Wnt/β-catenin signaling[98-100], SNHG1 promotes NSCLC tumorigenesis and progression via the miR-101-3p/SOX9/Wnt/β-catenin axis. However, lncRNA AK126698, which is usually downregulated, can inhibit the proliferation and migration and increase the apoptosis of NSCLC cells by repressing the Wnt/β-catenin signaling pathway through targeting FZD8 in a complex. Furthermore, chemosensitivity is induced through the inactivation of the Wnt/β-catenin pathway. LncRNA Meg3 regulates the specificity of p53 transcriptional activation, thereby inhibiting β-catenin/survivin of cancer cells to regulate cisplatin resistance in NSCLC. As one of the most common urological malignancy worldwide, bladder cancer is the fourth most common cancer in man and the ninth most common cancer in women. Given the high recurrence rate, poor prognosis, and low 5-year overall survival rates of bladder cancer, scholars should explore the molecular mechanisms underlying its tumorigenesis to identify novel therapeutic targets and molecular biomarkers for treatment. Liang Ying reported that lncRNA MALAT-1 might contribute to the EMT and metastasis of bladder cancer in vitro by activating the Wnt/β-catenin signaling pathway. Increasing the expression of lncRNAs associated with the Wnt/β-catenin signaling pathway regulates the progression and chemoresistance of bladder cancer. Overexpression of XIST can function as a sponge of miR-139-5p to regulate the expression of Wnt1, which activates the Wnt/β-catenin signaling pathway and functions in the pathogenesis of bladder cancer. Moreover, lncRNA TUG1 and UCA1 affect the outcomes of chemotherapy; TUG1 knockdown suppresses β-catenin expression to inhibit Dox resistance and upregulates UCA1 increased Wnt6 expression to induce cisplatin resistance. Hence, the interaction between lncRNA and WNT signaling plays an important role in bladder cancer chemoresistance. In addition to normal physiological functions, lncRNAs are deregulated in bladder cancer development and progression. LncRNA CASC2 is expressed at a low level in bladder cancer and inhibits Wnt/β-catenin signaling by decreasing the expression of β-catenin, thereby suppressing the growth, migration, and invasion of bladder cancer cells. LncRNAs are a highly heterogeneous group of transcripts that regulate gene expression and various aspects of cellular homeostasis, including tumor cell proliferation, survival, and migration or genomic stability through diverse mechanisms. Our collected data confirm that lncRNAs have great roles in the progression of tumorigenesis and, similar to protein-coding genes, are associated with a variety of cell signaling pathways. Although several pathways exist through which lncRNAs may be targeted to modulate biological cellular processes, the Wnt signaling pathway is a common feature of tumors and plays important roles in tumor progression and metastasis of different cancer types. The transcription of lncRNAs can provide signals of malignant transformation through their interactions with other cellular macromolecules, including DNA, protein, and RNA, to activate or suppress the Wnt/β-catenin signaling pathway. Hence, lncRNAs considerably influence the pathology of different cancers. Some Wnt-related lncRNAs that have been associated with cancer but are not reported previously are listed in Table 2. Moreover, the same lncRNAs may have diverse ways to target Wnt/β-catenin signaling in the progression of different carcinomas because of their highly tissue- and cell type-specific expression patterns. The interactions between Wnt/β-catenin signaling and lncRNAs have important roles in the development of tumorigenesis. The results provide evidence that lncRNA-Wnt/β-catenin signaling can be a potential target for cancer therapy and a diagnostic indicator to predict responses to treatments. In summary, Wnt pathway-related lncRNAs are differentially modulated in different types of cancer and the expression of downstream genes is correlated with tumorigenesis, tumor aggressiveness, and stages. The network of lncRNAs and Wnt/β-catenin signaling exhibits potential for discovery of novel diagnostics and therapeutics for cancer. Given that lncRNAs-Wnt pathway increases the therapeutic sensitivity of tumors by modulating several critical genes that confer resistance, the underlying mechanism of such network should be further explored to improve therapeutic efficacy and develop combination therapies. Although a large number of lncRNAs are identified to be associated with Wnt/β-catenin signaling in various types of cancers by binding to miRNAs or by regulating the key factors of Wnt signaling, such as β-catenin and TCF, some Wnt pathway-related lncRNAs and their detailed functions and specificity remain unclear and should be investigated in the future. Funding: This study was funded by grants from the National Natural Science Foundation of China (No. 81472663, 81502280, 81672845 and 81872304), the Education Department of Jiangsu Province (No. 15KJA320006), and the Project of Invigorating Health Care through Science, Technology and Education from Jiangsu Province. Corresponding authors: Jin Bai, Cancer Institute, Xuzhou Medical University, 84 West Huaihai Road, Xuzhou, 221002, Jiangsu Province, China. E-mail: bjedu.cn; Jun-Nian Zheng, Cancer Institute, Xuzhou Medical University, 84 West Huaihai Road, Xuzhou, 221002, Jiangsu Province, China. E-mail: jnzhengedu.cn.